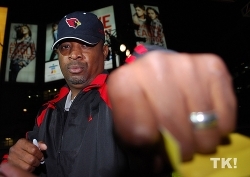 Chuck D. The Hard Rhymer. The man on the mic for the most politically explosive hip-hop group in history, Public Enemy. With albums like It Takes a Nation of Millions to Hold Us Back, Fear of a Black Planet, and anthems like “Fight the Power” and “Bring the Noise” along with the breathtaking production of the Bomb Squad, PE created a standard of politics and art. Perhaps their most controversial track was “By the Time I Get to Arizona” (1991), about seeking revenge against Arizona political officials for refusing to recognize Dr. Martin Luther King’s birthday. (Lyrics include "'Cause my money's spent on/The goddamn rent/Neither party is mine not the/Jackass or the elephant.") Today, in the wake of Arizona’s draconian anti-immigration Senate Bill 1070, “By the Time I Get to Arizona” has been remixed and revived by DJ Spooky. Chuck D also recorded his own track several months before the bill was passed called “Tear Down That Wall.” I spoke to Chuck about the music and the nexus between immigration politics and sports. Chuck D: I had done "Tear Down That Wall" four or five months ago because I heard a professor who works with my wife here on the West Coast speak in a speech about the multi-billion dollar dividing wall between the US and Mexico, so, therefore, I based "Tear Down That Wall" on the policy of the United States border patrol in the states of Arizona, California, New Mexico and Texas. I just wanted to put a twist of irony on it saying if Ronald Reagan back in 1988 had told Mr. Gorbachev to tear down that wall separating the world from countries of capitalism and communism, we have a billion dollar wall right here in our hemisphere that exists that needs to have a bunch of questions raised. Questions like: “What the hell?” I wrote the song about five months ago and I did it coincidentally, with all that’s brewing in the state of Arizona. Immigration laws and racial profiling is happening right here and I think the border situation, not only with the US and Mexico but the US and Canada, on both sides is just out of control. It's crazy. You did "Tear Down That Wall," we have the DJ Spooky remix of "By the Time I Get to Arizona," and with your wife, Dr. Gaye Theresa Johnson, you wrote a syndicated column on SB 1070. What’s the response been to you being so out front on this issue? Well the response is the usual, but I make it a habit not to look at any blogs, because I think the font of a computer gives as much credence to ignorance as it does to somebody who makes sense. So I try not to read those responses, because anybody can respond quickly. Back when people had to write letters it took an effort, especially if someone didn't have decent penmanship and handwriting. I try not to look at the responses. I try to do the right thing. I tell you this much, there is a rap contingent, a hip-hop contingent from Phoenix, who did a remake of "By the Time I Get to Arizona." I think that needs to be recognized because these are young people. The song is about eight minutes long. There's about 12 MCs on it, and they are putting it down. They are talking about how ridiculous this law is. They are speaking out against it and they are putting all the facts on the table, and they need to be acknowledged and highlighted. There is a stereotype about young people and young MCs [being apolitical]. They break it. It’s remarkable how the original “By the Time I Get to Arizona” has been resurrected from the early 90s now that the struggle has picked up. Did you hear former NBA player Chris Webber before the Suns/Spurs game say, "Its like PE said, ‘By the Time I Get to Arizona.’”? [laughs] My Dad told me about that. You know Chris Webber is the man. I wasn't tuned into TNT at that particular time. He said more than that. He said, “Public Enemy said it a long time ago. ‘By the Time I Get to Arizona.’ I’m not surprised. They didn’t even want there to be a Martin Luther King Day when John McCain was in [office]. So if you follow history you know that this is part of Arizona politics.’” So he brought it all together with Public Enemy at the center of it. Unfortunately when it comes to culture, the speed of technology and news today makes things out of sight, out of mind. While these situations [the MLK fight and the immigration fights] are different, the politics of both things stay around like a stain.... Once again Arizona has put themselves into this mix. I don't know what the hell was on Governor Jan Brewer’s mind or what contingent is behind her, but, you know, to make a decision like this and to be told to ignore the people who have been in this area on this earth the longest period of time. It just kind of resonates with me as being crazy. Do you support an athletic or artistic boycott of Arizona until this gets settled? Dave, you know I do. Artists and musicians can say we’re going to play Texas, El Paso, New Mexico, Albuquerque, and we gotta play LA. But we’ll skip Phoenix, Flagstaff, Tucson and the like. But you know what this is really a challenge for: that’s Major League Baseball. You’ve got nearly a third of the players who are Latino. If they don’t stand up to this bill, they will actually be validating the divide amongst Latinos [between documented and undocumented immigrants]. At the same time they’ll also be lining themselves right into the stereotype of what an athlete is if they don’t speak out: a high priced slave that doesn’t say anything. And to me it’s beyond just boycotting the All-Star game. What are those Latino players on the Diamondbacks going to do? What are the players going to say who go into Arizona to play against the Diamondbacks? What are they going to say and what are they going to do? Major League Baseball has to step up. The NBA has very few players of Latino descent and [the Suns] are saying something. But Major League Baseball, if they don’t say anything, it’s crazy. The owners, the team, the league, and especially the players, whether they come from the Dominican Republic, whether they come from Venezuela, whether they come from Puerto Rico, they better step up. If they don’t step up, the music industry, at least from my area, we’re going to clown them. For us to speak out against this law, and basketball stepping up, and Major League Baseball not stepping up at all?! Come on now, give me a break. And I know a lot of the cats they live in the Dominican Republic or Puerto Rico or whatever, there’s like a trillion years difference between them and their high salaries and the average people living in the streets. They might build themselves a castle with a militia to protect them, but this is the time to unite yourself with the people and at least live in the legacy that [Major League Hall of Famer] Roberto Clemente said of uniting people just to protect against the nonsense that the other side can come up with. They need to know that it’s going to spread if they don’t come up and say something about it. Any final thoughts? Perhaps about Major League Baseball pulling the All-Star Game out of Phoenix? At the end of the day man, sports is really not that important compared to people living their everyday lives. Say you have a Major League player, and he happens to play for another team, or he happens to play for the Diamondbacks and he gets pulled over because people think he’s an illegal immigrant. Then all of a sudden that’s when the “ish” finally hits the fan? Come on. This is beyond sports. We want athletes to speak up because they have advantages. They have everyday coverage. They’re covered by a person that has a mic and a camera in their face, and this is the time to step up. Major League Baseball pulling the All-Star Game out of Arizona should be the least of it. Originally published by Edge of Sports. Dave Zirin is the author of the forthcoming Bad Sports: How Owners are Ruining the Games we Love (Scribner). Receive his column every week by emailing dave@edgeofsports.com. Contact him at edgeofsports@gmail.com.